I feel sorry for the C64 lately as it seems the ZX Spectrum homebrew scene are getting more and more great releases that are out to impress. We even had the more recent ZX inspired Speccyjam with lots of lovely free retro inspired games to play. So here we are with Archeomania; a great Tetris style game developed by Ralf that has a pretty interesting twist. Unlike the usual Tetris with falling shaped blocks to make a filled line, in this one you need to save a girl by erasing the block rows underneath her in that usual Tetris style. If she reaches the bottom you've done it, but if she doesn't she'll end up being squashed by the spikes above. 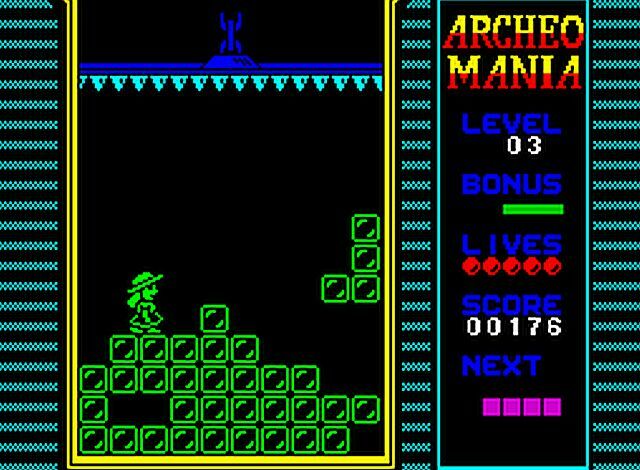 Archeomania is a fantastic homebrew retro inspired remake of Tetris Plus that everyone should download and play on either a real ZX Spectrum or through an emulator. It's both graphically appeasing and great fun to play.